There are about 13 volcanoes in Sulawesi, consist of 6 A type volcanoes and 2 volcanoes classified as B type. Last 5 volcanoes also classified as A type in archipelago Sangir. Located in Una-una island north Sulawesi.The hight of this volcano is 508 m above sea lvele.The volcano is starto with volcanic lake and clasified as A type volcano. Other name of this volcano: Nanguna and Una-una.Peak zone can be accessed by hiking from village Una-una for approx 2 hours of hiking. Located in district Modayang,regency Bolaang Mongondow North Sulawesi.This is a group of volcano consisting of volcano Ambang 1689, Muayat 1789.Other volcanoes in Ambang line group are small conical in shape, among them:Siak,Penopulau,Klotok,Bitaniand older conical volcanoes: Banga,and Kapaya.The volcano is starto with lava and clasified as A type volcano. Located in district Tombatu Minahasa North Sulawesi.Hight of volcano is 1783,7 m above sea level.The volcano is starto and clasified as A type.Peak zone can be accessed from village Pinebatengan district Tompaso. Located in district Tomohon,Minahasa,North Sulawesi.The volcano is twin volcano: volcano Lokon at elevation 1579,5 m and Empung 1340 m above sea level. On saddle between peaks of these volcanoes there are double craters Tompaluan which is now popularly called as crater Lokon. Hike up to the peak can be done from Kakaskasen where observatory camp is available and can be accessed from Manado. It's take only 1 hour hiking up peak. Located in district Tomohon, Minahasa North Sulaewesi.Elevation of the volcano is 1331 m above sea level.The volcano is starto, andclassified as Atype volcano.Name of this volcano's craters are:Mahawu,Wagio,Mawuas.To reach the peak's craters, the hike can be done from Kakaskasen as a starting point of hike. Hike duration: 1 hour from starting point. Located in village Makewide, district Bitung, regency Minahasa.Elevation of this volcano is 1149 m above sea level.The volcanois starto, and classified as A-type volcano. Hiking up peak can be done from village Makewide as starting point of hike.Hiking duration to the peak from starting point: 3 hours. Located in Arsipel Sangihe.This a volcanic island whic is also called Ruang Island with 5x5 km in widht, with crater 100 m in depth ( creation of 1915 eruption).Elevetion of the volcano is 714 m from above sea level. Other name of this volcano is Duwang. 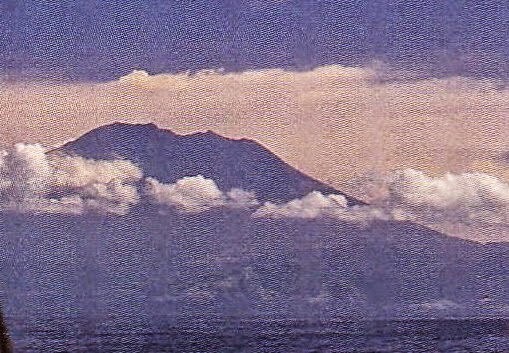 Located in Siu Island, Arsipel Sangihe.Elevation of the volcano is 1784 m above sea level.The volcano is starto, and classified as A-type volcano.Other name of this volcanois Api Siau.Peak's crater can be reached from southern slope at village Tarorane near by northside of harbor Ulu.Hiking duration to the peak 4 hours, hardest section of the hike is above 500 m alt. Located in Arsipel Sangihe, regencies Taruna/Tahuna and Peta.This is a starto volcano with crater lake, also classified as A-type volcano.Elevation of the volcano is 1320 m above sea level.and 3300 m from sea floor.Starting point for hiking up peak is fromvillage Anggis in south coast with actual duration of hike 3 hour.And take half hour to descend the crater from peak zone. This is a submarine volcano . This is a submarine volcano. Name of districts may change due to regional extension policy (locally called Pemekaran ), and related access may got better.